Can anyone provide comment as to whether the supply voltage influences the sensitivity of the receiver? It does, but only at the very bottom of it's operational range. Check the 4th page of the data sheet for a chart with the details. In my case, I'd like to use this IR receiver on an Arduino that also has a Serial LCD attached via NewSoftSerial. It just seems quite difficult to do. I donno, maybe I'm missing something. Bug report: The post above was formatted exactly as I wanted when I hit "Preview". When I actually posted it it took out all the carriage returns. Also, I couldn't get bulleted lists to work even in preview. What if, after displaying your message on the LCD, disabled the Serial library, and therefore enable interrupts? Does this have a lens? 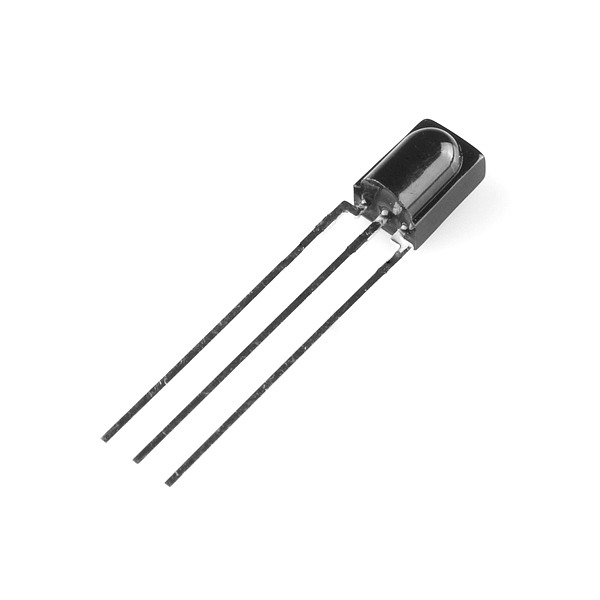 Does anyone know if the diodes LF1838, LF1838A, VF0038 and VS1838A do the same as the TSOP38238? I keep getting different codes as i move away from the receiver. Does anyone know how to fix this? i want to use this receiver with a pic18f4550 to control volume of an amplifier... what is the frecuency of the output signal so it can be demodulated?? The distance of receiving signals? According to its datasheet, it is about 45 m. Is it right? I'm novice. Does anyone know of any clean mounting hardware for this diode? Can you describe more of what you're look for? 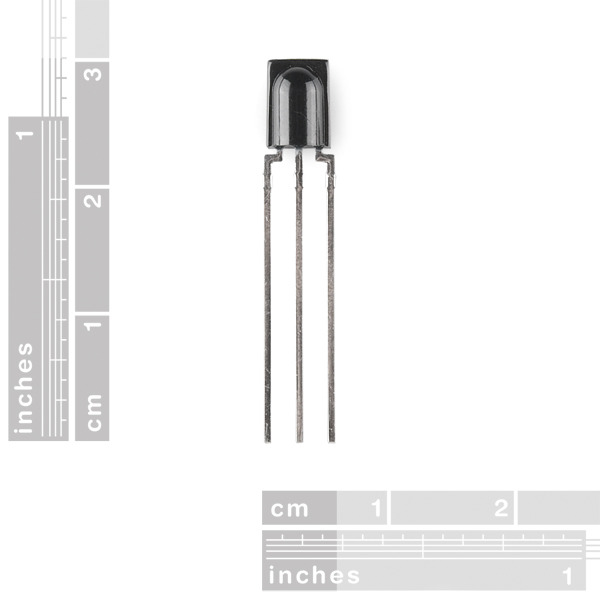 The pins are 0.1" so it's easy to use in a breadboard or pef board. If you're doing a custom PCB I've laid out many a board with a regular 0.1" 3-pin connector for the IR sensor. I usually rely on the legs themselves to situate the receiver where it needs to be directed. For more complex installations I use double stick tape to hold the sensor in place. Most consumer products will have the IR receiver sticking out of a PCB with smoke plastic covering up the ugly. Using this IR Receiver, an Apple remote, Arduino, and a few RGB LED's, I have created a fun remote controlled & portable planetarium of sorts. This receiver and the Apple remote were extremely easy to implement into this fun little project. I will be using this, along with that apple remote(that I never use with the actual computer) to control household appliances in the near future. I'm working on a swarm robot project and wanted to try IR as the means of communication. What is the receiving angle for this diode? I need as close to 180 as possible. I could not find this information in the data sheet. Thank you for any advice you may have. I'm confused by the datasheet. Is this supposed to support 30khz-50khz signals or only 38khs? A specific frequency, depending on the actual part. SFE's own tutorial, and others, noted that this particular part should be the TSOP38238, tuned for 38kHz signals. That's probably my problem. I was using a Samsung remote--not sure what freq but I was under the impression that IR remotes all use 38kHz (how else would universal remotes work?). Maybe this isn't the case? For receiving - i.e. a learning remote - it depends. There's quite a few that simply use a 38kHz IR receiver and call it done - since that's what most remotes do use. With a little luck, it just might accept 40kHz as well. Others simply stick multiple receivers in. Hey, whatever works. Yet others do away with a specific IR receiver altogether, and instead use a simple IR photodiode/transistor which doesn't care about carrier frequencies, and instead use a microcontroller to either detect and save it as a parameter for modulation, or simply store the entire signal 'raw' in memory for playback. The downside of this is, of course, that these are more prone to interference and you often have to hold the device's remote right up to the learning remote so that it gets as good a signal as possible (and even then the microcontroller has to perform a bunch of filtering). I wired it up with my Arduino last night--it sorta works--when I point a remote at it I get values, but the values I see are different every time I press a button. Seems like they should be consistent, no? Maybe someone can help me out. I need to prototype an IR receiver at 14 HZ. I see a lot of 38 kHz but not 14 Hz. This is a very specific application. I need something low power with as long range as I can get (within reason). Any ideas? All I need it to do on the prototype is turn on an LED. Thanks. Would undervolting it by .3V be a bad idea? Just received one of these and am currently messing around with it using an Arduino Uno, a cheap blank remote control I found at a dollar store, and Ken Shirriff's IRRemote library - it's working great and it seems like a cool way to provide input for projects! So here's a question for those of you who know what you're doing (unlike me). I can set this receiver up on an isolated circuit (powered by 2 AA cells), attached to a visible LED, that lights up when the TSOP goes low. Works great, and I can see it light up when I press buttons on a remote. The weirdness comes in when I start using my arduino uno to generate a signal (38khz + pulsed) that I will eventually drive an IR LED. But before I even attach the signal to a LED, I can get the receiver circuit to light up just by touching an exposed end of the wire hooked up the arduino's output pin. I swear that the receiver is electrically isolated from me and the arduino completely. The only thing I can think of is RF. Is this TSOP really that sensitive to RF interference? Follow the schematic on the Datasheet. I blew mine without it; they're VERY sensitive. I have something nearly EXACTLY like this on several IR control helicopters I own. Is there an easy way to replace this with something that would receive RF? And could I convert the IR remote to RF too? I don't know if they still do, but the older Dish Network receivers had a RF to TTL board that internally connected to the IR in line. a Playstation 2 Remote works well with these, so many buttons. The data sheet seems to imply that 950nm is the wavelength of IR light to use. I need to detect a infrared light that run at 1.2khz. I just need to know if "there is a ball" or if "there isn't a ball". There will be no data being sent, or received. Will this sensor works? all 38khz will work? if not, witch one will work? Has anybody used this over long range with an IR Diode ? I want to make a IR Beam Detector for security puposes , distance 10 - 20 metres ? I also posted a simple tutorial to get people started with this receiver. It includes pictures from an oscilloscope so people can see what's happening when the receiver detects an IR light. Is this in the SFE Eagle Library? You can use a 3x0.1" header, it'll work just the same. Does anyone know what this returns in terms of values? Datasheet says 100mV for low, VCC for high. Keep in mind this is digital... so you can't get a in-between reading. Is anyone else having a problem getting anywhere near VCC when running this at 5v? I ordered one a while ago but it doesn't break 2v on out when running at 5 volts, with the recommended cap and resistor and without. I scoped it and it gets the signal just fine and does break the logic threshold for a 3v application however I intended to use it on a 5v supply and logic. Did I get a bad part? Never mind, apparently my o-scope has a hard time giving accurate voltages at 5mA of current. Those with old cheap o-scopes may wish to keep this in mind. The product title is slightly misleading - even though it looks like a diode, it's actually an entire IR receiver like the ones in the little metal boxes, but this one is packaged in an epoxy package (like a diode). The datasheet shows several different part numbers based on their carrier frequency. Can you tell us which frequency this part uses? How did you know that? Its not obvious looking at the product description. Mmm nice. Good timing for me. These will be great for my next project.